When Chef Ryan went to pick strawberries and a load of other beautiful vegetables at Quivira early Thursday morning, he took Justin along, younger brother of his entremetier Andrew Wycoff. “Jr” is the youngest and newest member of the kitchen brigade, currently working the garde manger station. The trip made such an impression he couldn’t stop talking about it. He was especially blown away by "how much food" could be grown in such a (relatively) small area. You have to know what you are doing, of course, but when you do ~ as Andrew Breedy, Quivira’s lead gardener certainly does ~ it’s hard not to be impressed with the variety and abundance of what we can grow here in Sonoma County. For a young chef it’s particularly important to understand at the beginning of a career how essential it is to get to know a few great farmers and endear yourself to them, the better to get up close and personal with what they grow. Back in the kitchen, Ryan decided to create a vegan vegetable starter for guests dining with us that night, which is not as easy as it sounds. Put a few delicious veg on a plate and call it a day, right? Not around here. Look up the definition of Haiku in the dictionary and you will find it is a classic Japanese poetic form which traditionally has 17 distinct phonetic units, concluding with a lingering message. Historically, it adheres to a strict format that relies on the juxtaposition of key words to describe images, separating them by what the Japanese call "Kireji"or ‘cutting words’. I was reminded of Haiku as I watched Ryan ~ with Jr. eagerly assisting ~ begin to plate an edited version of the bounty they’d collected at Quivira. One of the hallmarks of a good Haiku is that it leaves you with a single resonating thought. 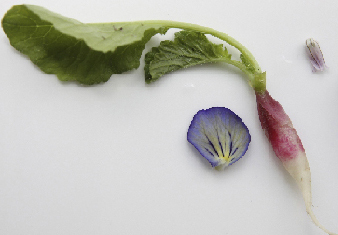 With his Early Summer Vegetable Plate from Quivira Gardens, the message of this visually arresting Vegetable Haiku was clear: when it comes to great produce, less really is more. While Ryan's creation was only comprised of 13 "elements" for me it captured the spirit of the Haiku form, and what I love most about Japanese culture in general. Theirs is a pared down sensibility that goes hand in hand with a reverence for spare lineal form, with a profound, if understated, message that often takes a reverence for the natural world into account. While Chef seemed to place the ingredients on the plates swiftly, he did so in a way that allowed each to “speak” to one another ~ in color, shape, and most certainly in taste. As you ate across the plate each element played against the next, yet each, in its own way, remained completely distinct. The rhubarb was peeled before being steeped in boiled water with a bit of grenadine, the ‘secret’ prep I mentioned last week that Octavio, our talented pastry chef, also employs for the rhubarb batons we serve with the Layered Rhubarb Financier we currently have on the dessert menu. To get the most out of its unusual flavor profile, rhubarb needs to be peeled (the skin is stringy, and can be bitter) then treated with care. Never boil it. Don’t let it get too friendly with sugar. Slipping it into water that has boiled and been infused with grenadine allows this faux fruit to cook just enough as the water cools. The grenadine helps hold and even enhance its extraordinary color. The strawberries were cored and slivered; the fennel was shaved, thinly, then lightly dressed in a few drops of Preston OO and champagne vinegar. Ryan’s generosity as a chef is always present in the way he encourages those on the brigade that show an interest (and a propensity) for visual artistry to try their hand. It’s NOT as easy as it looks. I have seen him change one thing on a plate that shifts the entire visual balance of the dish. I can’t say how much this ultimately affects the diner but if you believe, as we do, that you eat with your eyes first, his talent provides an vital conduit to our guests that truly expresses what we feel about the primacy of our exquisite ingredients. No matter how complex or how many steps Chef takes to complete a dish ~ initially it's the integrity of those ingredients which inspire each plate of food. The interest our young chef showed for his experience at Quivira is a good lead-in to a subject I’ve wanted to talk about for a while now, as the dialogue over whether or not it’s a good thing for wineries to grow food heats up. Not simply because I have strong feelings about the subject ~ whatever your viewpoint, I hope you’ll agree it’s an important discussion that should not be dominated by fear. 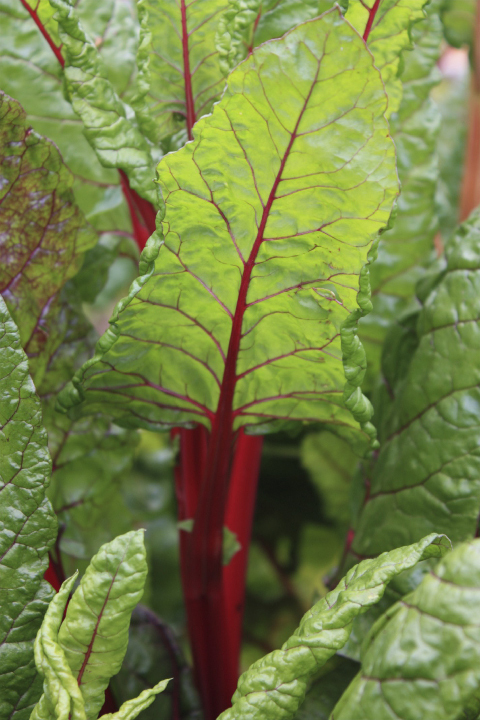 When Quivira was denied a space at the Healdsburg Farmer’s Market last year we understood why ~ growing food is not the main thing they do and we could see the argument that coveted space at Farmer's Markets should be allotted to farmers whose main source of income is food. The revenue generated from market sales is often crucial to their thriving, if not surviving. But. It’s a far step from that thought to not supporting wineries with a genuine interest in expanding their business model from the mono-culture of grapes into a diverse ecology that includes vegetables, fruits, and even animals. Quivira has done an exemplary job in this regard. 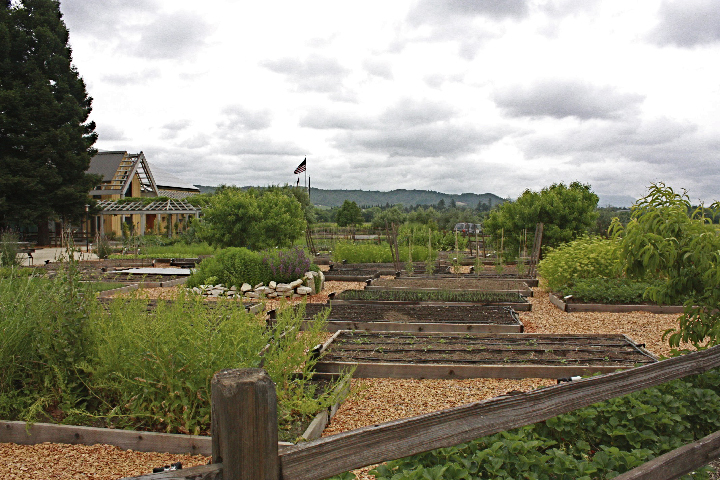 Their single acre garden is open to the public, laid out and 'explained' in such a way as to make a trip to the winery, whether or not you are imbibing, worthwhile. In addition to the educational piece of having the veggie beds, the chickens, the bees, and the fruit trees all up front and accessible to the crowds that visit the winery all year, they sell fairly priced produce to a select number of farm to table restaurants, as well as hosting events throughout the year that make a direct connection between their wine and food grown sustainably right alongside their grapes. And that’s not all. 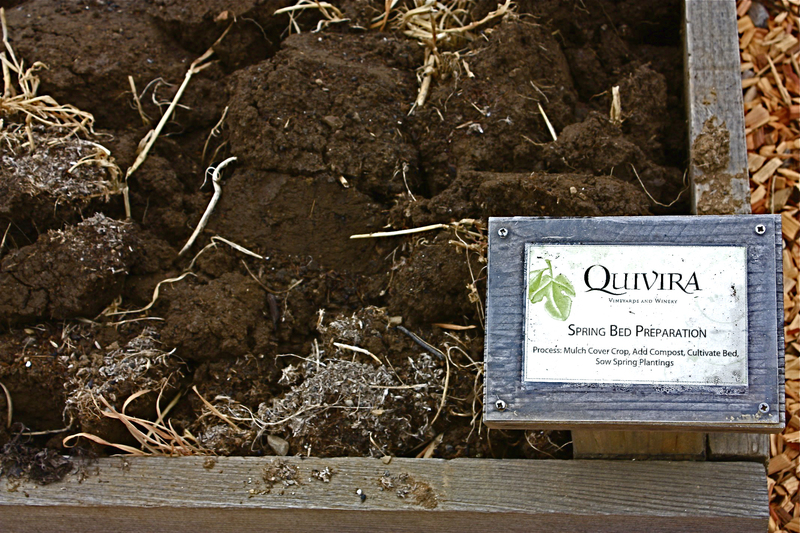 A few years ago when Quivira first started their food growing program in earnest, they invited restaurants that shared a commitment to superior local sourcing to each subsidize a raised bed that could be grown exclusively for that restaurant. The worthy sub-text to this plan was that in addition to the publicity it afforded both ends of the collaboration, all the money raised from the restaurants was donated to the Northern Sonoma Healthcare Foundation. That Quivira could afford such largess because the owners are not struggling farmers doesn’t take away from the merit of this ongoing program, nor does the grape component dilute an authentic ‘how food is grown’ experience their garden offers to thousands of visitors who thought they were only heading out to West Dry Creek to sniff and sip. To our mind, it’s always a good thing to see more land turned over to growing food ~ especially when it’s done properly, which Andrew and his crew are certainly doing at Quivira. We fail to see a down side to it. Can every winery go the distance to the extent Lou and Susan Preston have as they literally 'grew' what was once Preston Vineyards into the bio-dynamic farm+vineyards that is now Preston of Dry Creek? Of course not. But does that mean we shouldn’t encourage more wineries to have a go? On the one side you have farmers who do not have the benefit of a potentially lucrative cash crop like grapes feeling threatened that they are up against deep pocket dilettantes who are using produce gardens and a few farm animals to romanticize their core business to the public. On the other you have the oft-criticized mono-cultural business model of the vineyard/winery diversifying into food ~ allowing the wine obsessed public to be exposed and educated a bit about how food is grown, as well as making more sustainably farmed crops available to restaurants who want to source locally. Least we forget ~ restaurants, especially those committed to buy from the food shed, also struggle with small profit margins. 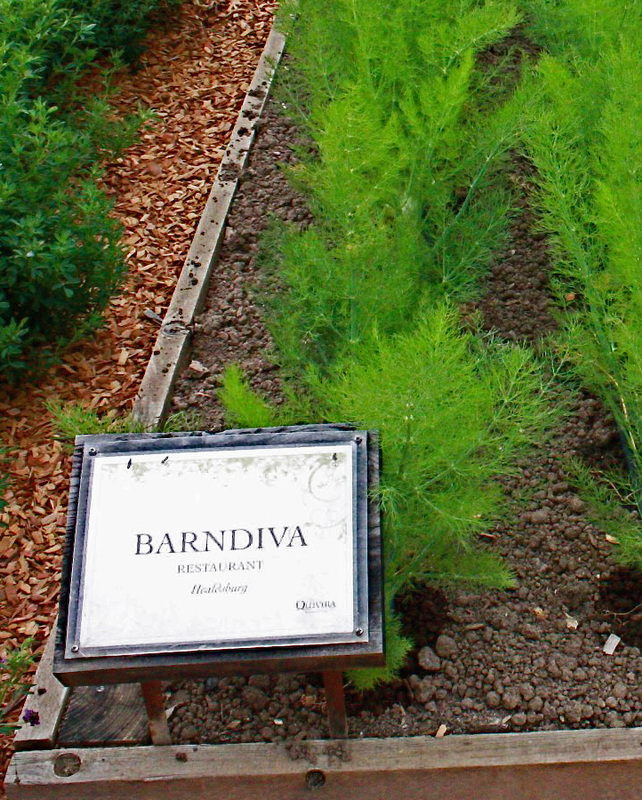 Barndiva welcomes relationships with wineries that grow food, especially when they also extend ethical farming practices to their vineyards. At the end of the day, we will always try and support those who have a vested interest in seeing local farm to local table sourcing thrive. But dinner on the house to anyone out there who feels a Haiku coming on that might further clarify this complicated and often vexing issue .